Say goodbye to old-fashioned, tacky gels that leave flaky residue on your daughter's hair and scalp. Finally, there's a conditioning styling gel that contains NO ALCOHOL which means there is no crunchy, stiff feel that causes hair to break. Fortified with Extra Virgin Olive Oil, it strengthens while giving superior hold and a healthy-looking shine. 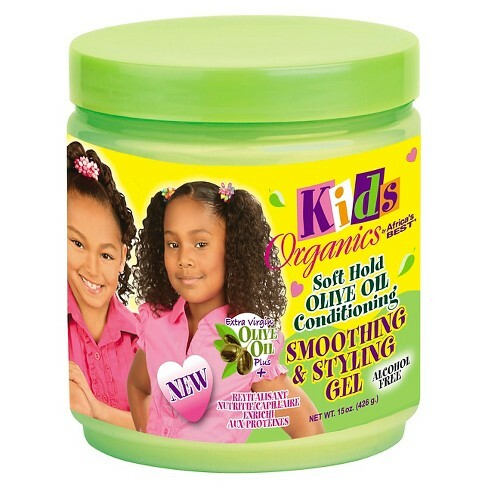 Kids Organics Soft Hold Olive Oil Smoothing & Styling Gel also contains Organic Conditioning to add moisture and protein to hair, while you create beautiful, long-lasing styles. Use it to hold ponytails and twists and to help create wet curls, candycurls, finger waves, or any smooth-looking style. The anti-frizz formula lays hair down without weighing it down.